Taking the time to plan a new kitchen design is arguably the most important step in the remodeling process. A clear, well-conceived plan will guide you through each phase of the remodel and help ensure that the work progresses smoothly and stays on budget. Here, we’ll show you the steps to take and provide you with some valuable remodeling design tips. A. 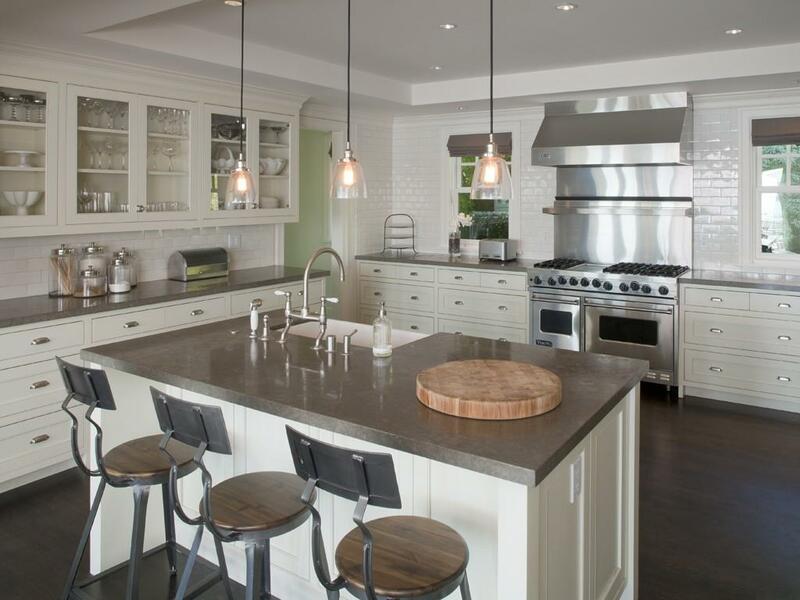 Evaluate Your Kitchen: Begin by carefully evaluating your current kitchen to identify all the necessary upgrades. List all the improvements you plan to make to the layout, cabinets, appliances, cabinets, sinks, faucets, flooring and lighting. Consider any features you might want to keep. Think about storage and secondary kitchen activities. From here, you’ll be able to decide whether you want to change the entire floorplan or simply renew some areas. The biggest regret people have is not maximizing space or storage opportunities. If you’re remodeling, it’s a lot easier to put storage pieces in during construction; it’s much harder to retrofit. B. Assign a Budget and Time Frame: Consider how much time and money you are willing to spend on each component of the project and try to stick with it (but leave some wiggle room for overruns). Major budget items include cabinets, countertops and contract work. Consider how your life will change around the remodel, and use this as an opportunity to identify jobs you might be able to do yourself. See “Step II: Budgeting for a New Kitchen” for more specific budget advice. C. Consider the Details: Think about the color and finish of the cabinets, counters, backsplash, walls and floor. Then choose a palette of complementary or contrasting colors. Make sure kitchen products and appliances work appropriately with the space and are in line with your design aesthetic. 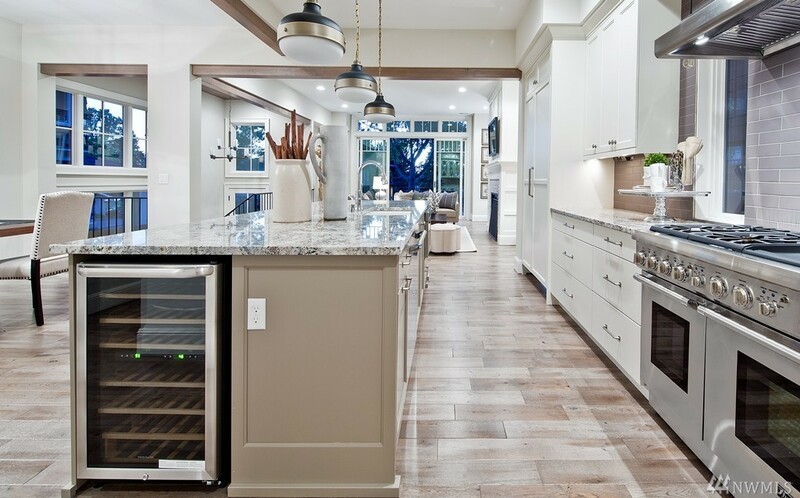 Once you’ve created a list of all the upgrades and improvements you’d like to make, you’ll need to decide whether or not to change the kitchen’s floor plan. Changing the floor plan will have a profound effect on the budget and timeframe. However, it is the most dramatic way to transform the space into your dream kitchen. If you want to control costs and complete the remodel quickly, consider renewing your kitchen versus remodeling it, or choose a layout that fits into the existing kitchen space. 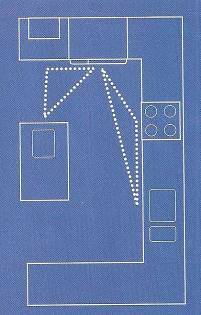 Here are drawings of the six most common kitchen layouts. 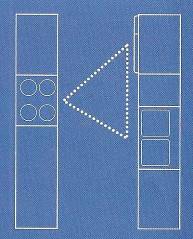 Each drawing also includes an outline of the work triangle, which represents the distance from the refrigerator to the range to the sink. 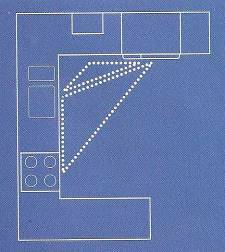 The L-shape layout is the most popular of all kitchen layouts. It’s functional, doesn’t require an inordinate amount of room, and provides an adequate amount of cabinet and countertop space. One leg of the layout is usually slightly longer than the other. Approximately 6 ft. by 12 ft. measured along the front edge of the countertop works best. For spaces larger than 6 ft. by 12 ft., the kitchen would typically have a peninsula. The U-shape layout wraps around three walls, providing more cabinets and countertop space than the L-shape layout. This type of layout works well in mid-size kitchens but feels cramped in smaller spaces. The galley layout has cabinets and countertops along two facing walls, which works well in narrow kitchens with a doorway at each end. It creates a relatively efficient workspace but has a limited amount of cabinet and counter space. The one-wall layout provides a way to squeeze a kitchen into a very small, narrow space. There aren’t many homes with a one-wall kitchen, but it’s not unusual to see one in an apartment or condominium. Unfortunately, this isn’t a very efficient layout and it offers the bare minimum amount of cabinet and countertop space. 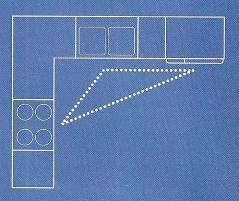 Adding a peninsula to an L-shaped layout effectively converts it to a U-shaped kitchen. You gain a few extra feet of cabinets and countertops, and can even create an eat-at bar. This type of layout is often used when a wall is removed from an L-shaped kitchen to open up the space to the adjoining room. U-shape layouts don’t work very well in large kitchens: The walking distance from one side of the layout to the other is too great. To solve that problem, add a center island. The island not only shortens the distance, it also increases storage and countertop space and provides a spot to install a second sink, cooktop, oven or range. Consider who uses the kitchen. For example, it takes 5 feet of space to make a turn in a wheelchair. If adding an island, the best way to get a feel for its size is to measure and tape out its footprint on the floor before ordering the cabinets. If you still can’t decide if an island will fit, try a mock-up of a full-scale island out of cardboard boxes and then live with it for a few days. It’ll soon become obvious if you need to alter the size or position of the island. 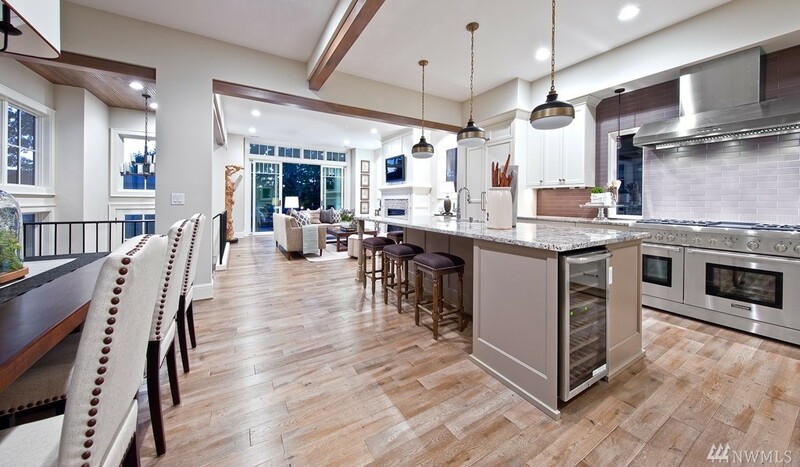 This spacious eat-at center island fits perfectly into this U-shaped kitchen. Walkways should be a minimum of 36 in. wide. Work aisles should be at least 42 in. wide (48 in. for two cooks). Work triangle (from sink to range to refrigerator) shouldn’t exceed a total 26 ft.
No one side of triangle should be shorter than 4 ft. or longer than 9 ft. 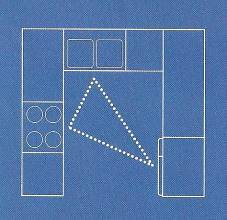 The main flow of traffic through the kitchen shouldn’t pass through the work triangle. Kitchen doorways should have a clear opening of at least 32 in. No kitchen door should interfere with the door on an appliance.